Users searches with different phrases like how to cat and remove commented lines. 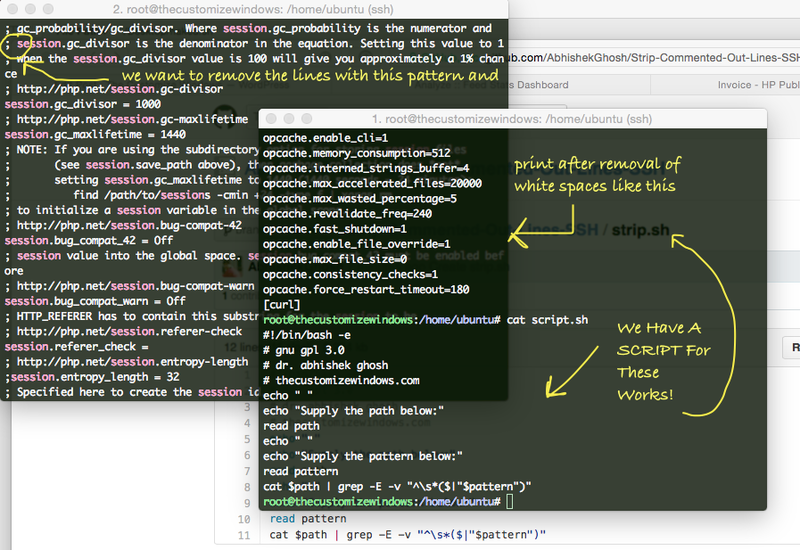 Here is How to Print Without Commented Out Lines on SSH/CLI. PRINT is the right phrase. There are many tools and combination of commands to do the same work. Why only cat, there are many other animals on this Earth! Whatever you use, you probably need to use unix pipe. Let us take the example of this method to Remove Expires Thu, 19 Nov 1981 PHP Header in Ubuntu Server. We are using unix and GNU/Linux for over 1.5 decades. We know the approximate location of a string in the php.ini file, even some times the line number remains in memory. php.ini is an ugly file with billions of comments. The production files looks like a documentation. It is difficult to search for a group of string which can not be filtered out with simple grep. We are not writing anything to the file. sed -e '/^;/d' /etc/php5/cgi/php.ini cat /etc/php5/cgi/php.ini | perl -lne "print unless /^;/"
cat /etc/php5/cgi/php.ini | perl -lne "print unless /^;/"
cat /etc/php5/cgi/php.ini | grep -E -v "^\s*($|;)"
this will remove all the commented out lines with ; and collapse the white spaces. As it is difficult to remember the bigger size command, we can make it a script. We have kept it as a Github project here. #!/bin/bash -e # gnu gpl 3.0 # dr. abhishek ghosh # thecustomizewindows.com echo " " echo "Supply the path below:" read path echo " " echo "Supply the pattern below:" read pattern cat $path | grep -E -v "^\s*($|"$pattern")"
echo "Supply the path below:"
echo "Supply the pattern below:"
cat $path | grep -E -v "^\s*($|"$pattern")"
and hit the return key. Quite obviously, you can directly wget the RAW file from the GitHub repo. Follow the repo owner or fork it to remember the simple thing. This Article Has Been Shared 176 Times! Why OpenStack is the Best Choice for Both Private and Public Cloud as we always say ? Here is the explanation one must consider OpenStack to avoid vendor lock. Cite this article as: Abhishek Ghosh, "Print Without Commented Out Lines on SSH / CLI," in The Customize Windows, June 2, 2015, April 23, 2019, https://thecustomizewindows.com/2015/06/print-without-commented-out-lines-on-ssh-cli/.